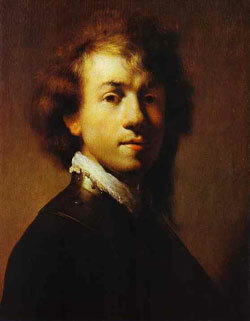 Today is the birthday (1606) of Rembrandt Harmenszoon van Rijn. I don’t feel the need to give you an art history lesson here. I’m assuming you all know what a Rembrandt looks like and that he painted Biblical stories, stories from Classical myths, and portraits (including lots of self portraits – some of which are pictured above). What I’d like to do is delve into his personal life because that’s the part that is less well known. I’ll start with his name. 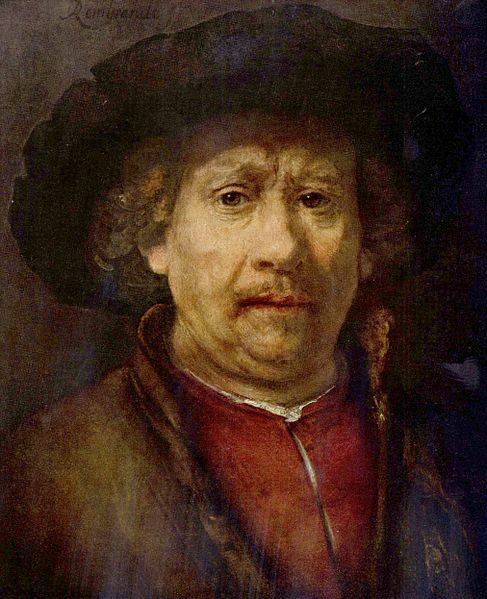 The first name Rembrandt was—and still is—extremely rare. It is akin to more common Dutch first names such as Remmert, Gerbrand, or Ijsbrand. The way Rembrandt inscribed his name on his work evolved significantly. 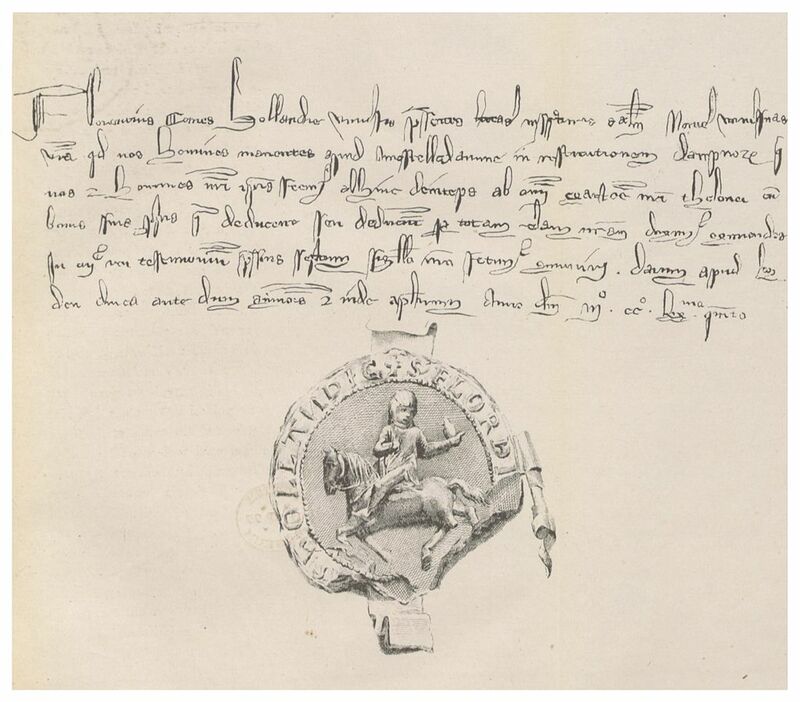 As a young man he signed his work only with the monogram RH (Rembrant Harmenszoon, “son of Harmen”); from 1626/27, with RHL; and in 1632, with RHL van Rijn (the L in the monogram presumably standing for Leidensis, “from Leiden,” the town in which he was born). 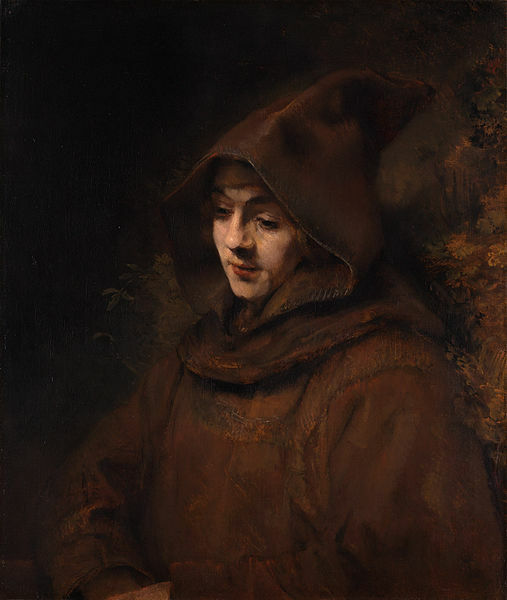 At age 26, he began to sign his work with his first name only, Rembrant (ending only with a -t); from early 1633 onward until his death, he spelled his name Rembrandt (with -dt) and signed his works that way. 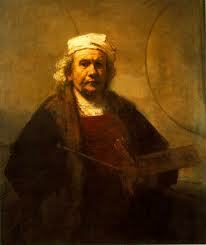 Rembrandt spent his formative years in Leiden and studied art there. At the end of 1631 Rembrandt moved to Amsterdam, which was rapidly expanding as the new business capital of the Netherlands, and began to practice as a professional portraitist for the first time, with great success. He initially stayed with an art dealer, Hendrick van Uylenburgh, and in 1634, married van Uylenburgh ‘s cousin, Saskia van Uylenburgh. 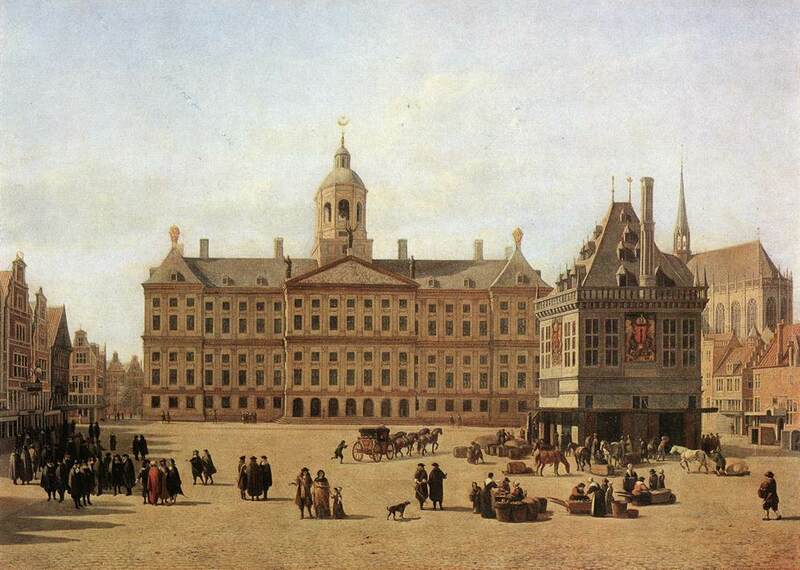 Saskia came from a good family: her father had been lawyer and burgemeester (mayor) of Leeuwarden. Rembrandt and Saskia were married in the local church of St. Annaparochie without the presence of Rembrandt’s relatives. Although by this time Rembrandt was affluent, the couple suffered several personal setbacks. Their son Rumbartus died two months after his birth in 1635, and their daughter Cornelia died at just three weeks of age in 1638. 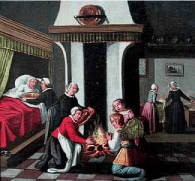 In 1640, they had a second daughter, also named Cornelia, who died after living barely over a month. Only their fourth child, Titus, who was born in 1641, survived into adulthood. Saskia died in 1642 soon after Titus’s birth, probably from tuberculosis. Rembrandt’s drawings of her on her sick and death bed are among his most moving works. 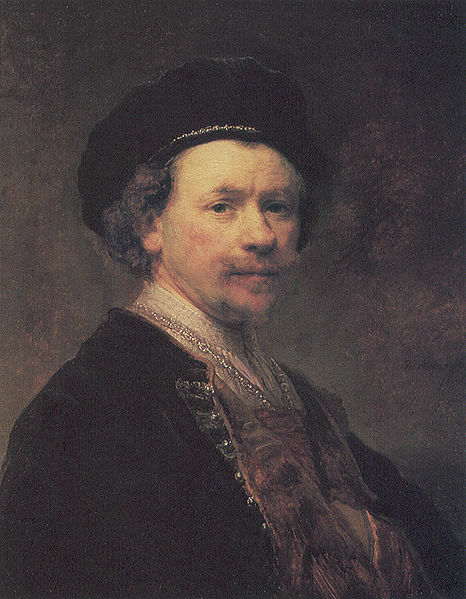 Apart from his relationship problems, Rembrandt also had financial problems. It was not that he was earning little, but that he spent more than he made. His passion was collecting art works and other artifacts. To avoid bankruptcy he put up for sale the bulk of his collection. The sale list survives and gives us a good insight into Rembrandt’s collections, which apart from Old Master paintings and drawings included busts of the Roman Emperors, suits of Japanese armor among many objects from Asia, and collections of natural history and minerals. 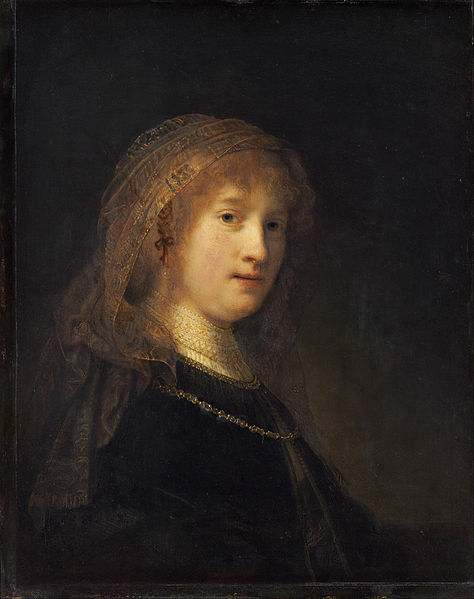 Despite his problems Rembrandt continued to complete major commissions up to his death. He outlived both Hendrickje, who died in 1663, and Titus, who died in 1668, leaving a baby daughter. 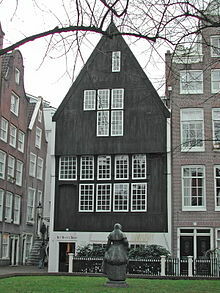 He died within a year of his son, on October 4, 1669 in Amsterdam, and was buried in an unmarked grave in the Westerkerk. I will talk about one of his works because it pertains to today’s recipe. “The Flayed Ox” (also known as “The Carcass of Beef”) is one of his most celebrated works. It has been copied in various styles many times, down to the present day. I first learnt of it at about age 17 when the headmaster of my school was teaching an enrichment class to students already too specialized in their subject fields for their own good. He brought a copy of the painting to class and spent the 40 minutes talking about why it was such an amazing painting. First there was the subject matter itself – not a Biblical scene or portrait of a fine gentleman, but a gutted cow hung in a dark, squalid shed. Then there was the technique – how the use of the variegated, thick impasto brings the carcass massively and magnificently into existence, particularly when contrasted with the thinner paint of the background. 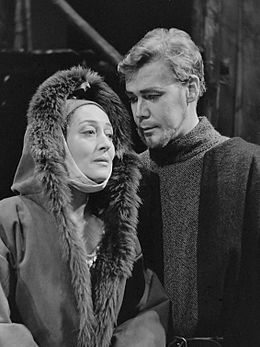 Next came the symbolism – reflection on life and death, the comparison with the grimness of the crucifixion . . . You get the idea. I never forgot the painting, nor all that my headmaster had said. So imagine my joy when about 6 yrs ago I was in the Louvre with my son (15 years old at the time), and there in a room wallpapered with Rembrandts was “The Flayed Ox” tucked into a corner dwarfed by much larger canvases (it’s quite small – 37”x 27”) I took him over and repeated my headmaster’s lesson. An amazing moment. 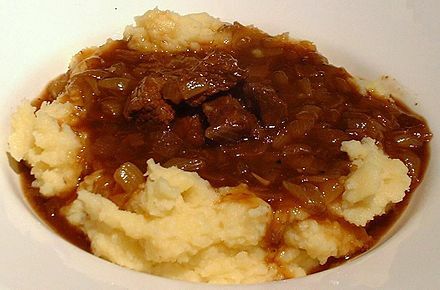 In honor of “The Flayed Ox” here is a classic Dutch beef stew – Draadjesvlees. Draadjesvlees means “meat threads,” describing the dish perfectly: stewing beef is reduced to threads bathed in a rich and spicy broth. You must use stewing beef to get this dish right. That means (in the U.S.) chuck or bottom round – tough meats that become tender and flavorful after hours of cooking. This dish is often paired with Rode Kool Met Appeltjes (red cabbage and apples), so I am adding that recipe too, free of charge. I’d suggest some boiled potatoes as well to complete the dish. Melt half the butter in a large heavy pot. Add the onions and sauté over medium heat until they are golden. Remove the onions and set them aside. Add the remaining butter to the pot and brown the beef over high heat. Return the onions and add the stock, spices, vinegar, and salt and pepper to taste. Bring the stock to the boil and then reduce the heat to low. Cover with a lid and let the pot simmer gently for at least three hours. Check periodically to be sure the liquid is not reducing too much. Add water if so. The ideal is to have a thick silky gravy when the meat can be pulled into shreds with a pair of forks. If the meat has not reached that stage, keep simmering. If the meat is ready and the gravy is too watery, remove the meat and reduce on medium-high heat. Then return the meat to heat it through. Fish out the spices before serving. Remove the tough outer leaves of the cabbage and cut it lengthways into quarters. Cut out the cabbage core, and then cut it into thin strips. Wash the cabbage strips thoroughly and put them into a pot with what water clings to them. Add the vinegar, sugar, and spices. Simmer until the cabbage is cooked to the tenderness you prefer. This is very much a judgment call. I like mine al dente, others like it very soft. Do it your way. Peel and core the apples. Quarter them and cut them into small slices. Add the apples to the pot near the end of the cooking time so that they cook for 3-4 minutes only. Before serving, check the sweetness and spices and adjust if necessary.